As you’re probably all aware, next year is the centenary of the start of the First World War. I’m sure that as the date gets closer there will be a lot of publicity about the multitude of events arranged to mark the occasion. There’s going to be plenty of opportunity for us, as writers, to get involved with this anniversary – as long as we don’t leave it too late to get started! I’ve just done a quick trawl of the internet and found the four writing competitions listed below with a ‘war’ theme. Mardibooks First World War Centenary Short Story Competition – winners will be published in an anthology and up to 12 entrants will receive feedback on their stories. Word count 1,200 to 5,000. Closing date 29th November, 2013. Entry is FREE. Tower Theatre First World War Play Writing Competition – closing date is September 27th, 2013 – so you need to get your skates on! The winning play will be performed in London in November 2014. Curry Mallet First World War Short Story Competition – this competition is not yet open for entries but watch the website or use the contact form on there, to get more details. But this gives you plenty of time to do some research! Also, don’t forget all the opportunities for magazine articles with a nostalgia or unusual factual slant. Why not pick up your pen and have a go? 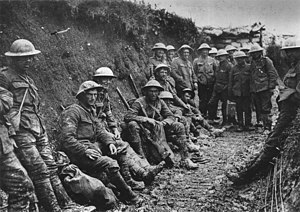 Remember all those men who gave their lives in muddy, wet, stinking trenches so that we might live in peace. This entry was posted on September 22, 2013, 9:00 am and is filed under Competitions, Markets, Non-fiction, Poetry, Short Story. You can follow any responses to this entry through RSS 2.0. You can leave a response, or trackback from your own site. What a good post Sally. I have a WW1 story which was Highly Commended in Writers’ Forum and not yet published so I may have a go at one of the comps above. I’m also involved in the West Sussex Great War Project run by library services. I’m researching couple of case studies on local nurses who served in the war. The case studies sound interesting, Tracy – and will be useful for giving your stories an authentic feel. And good luck with the story you already have – definitely worth sending it elsewhere if it got highly commended. Thank you for the links, Sally. I’ve never written about war either, Linda. I want to have a go but not sure where to start. It has to be research first, I suppose. Thanks for the reminder Sally, I was hoping to send my Rupert Brooke research somewhere, also Edith Cavell, Those competitions look good as well. I can never resist a freebie. Sounds like you’ve already got some good stuff ready to go, Susan. Nothing ventured, nothing gained! Thanks Sally. I may try to write a short story from an extract from my novel. Thank you for the links. I’ve never entered a competition yet so maybe this will be a first. Fingers crossed for you, Diana. Entering competitions can be good discipline for writers – having to meet a deadline and stick to a word count. I am already at the end of a WWII manuscript. I shall be bothering you for a critique of the foreword and other submission material in the near future. I have some WWI material, but I’m going back to fiction after this. Living with one war is quite enough. I look forward to reading your WWII submission material, Hilary. And I can understand you might need a break from war for a while but I’m sure there’ll be other opportunities to use your WWI stuff over the next 4 years to 2018, as the centenary celebrations continue. Enjoy your return to fiction!